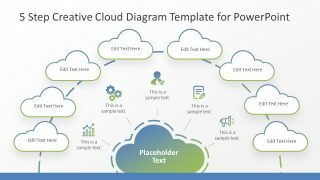 The Journey for an Orchestrated Data Center PowerPoint Template is an IT concept presentation. 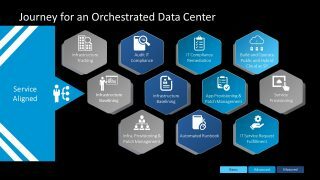 The orchestration in computing means automation of workflow processes altogether. These may include, coordination and management of computer system along with additional services and middleware. 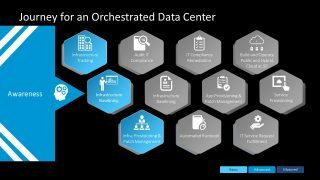 This presentation provides the impressive graphical layout to display orchestrated data center. It is an ideal PowerPoint to educate professionals on the complete journey of Orchestration. It involves the 5 main processes moving along the three segments timeline of maturity. 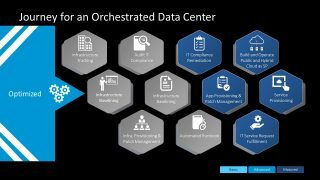 These segments show the conversion from automation to orchestration and then transformation. 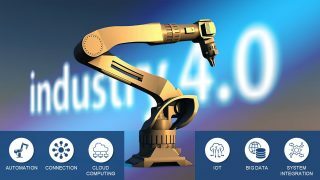 Whereas the 5 processes include awareness, standardization, proactive, service alignment, and optimization. Moreover, the PowerPoint of these five factors provide two different, yet interesting versions of a capability matrix. It can assist the presenter to define the basic, advanced, and matured subprocesses. 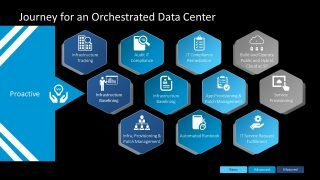 The Orchestrated Data Center PowerPoint Template has a blue and gray theme with a black background. 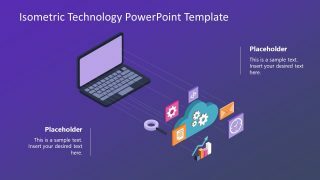 It is a common color selection for presentation in IT organizations. 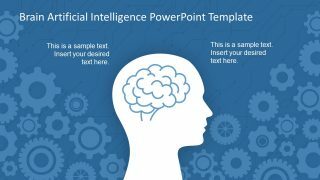 However, the editing features of PowerPoint assist the users to customize the color theme of the orchestrated data center template. Further, the two layout designs contain clipart icons to graphically display each term. The use of graphics like shapes and icons enables viewers to remember the concept for a longer period. Here, the first slide shows a data table view of rows and columns in the capability matrix. And, the next five slides display each of the five main processes individually with 10 parameters of the matrix. 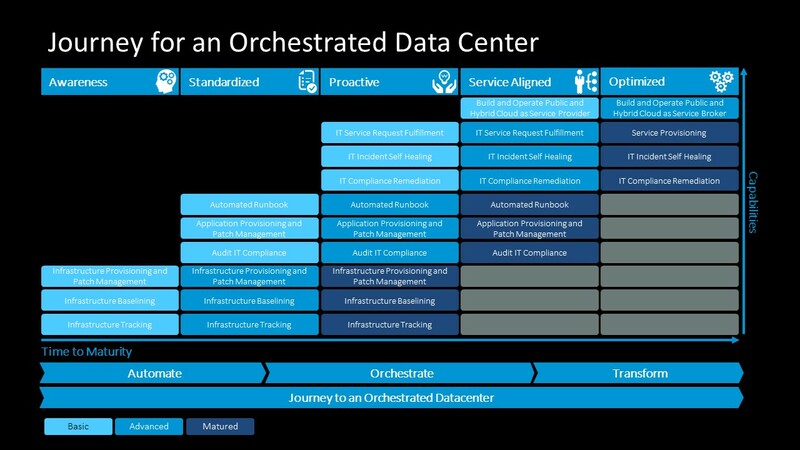 The orchestrated data center journey is a timeline and mapping template of PowerPoint. The slides show the parameters in distinct colors as their maturity levels. This feature also assists the audience to visualize the transformation in a data center. The journey PowerPoint for the orchestrated data center can benefit IT companies and departments in the large corporation. The companies can present their standard processes and coach the staff on enterprise applications and IT services.